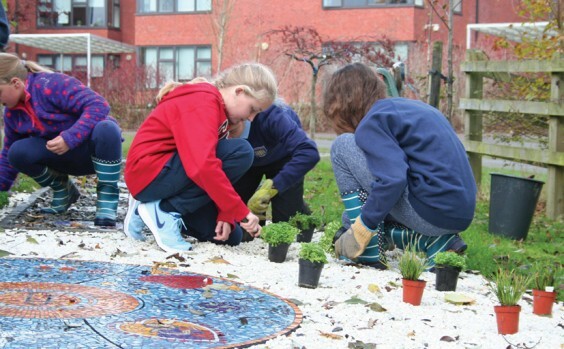 Hannah Genders adds planting to a very special creative project. I spent an afternoon recently planting bulbs and Alpines with the gardening club at Alvechurch Middle School, in a very special garden. A garden that has been created to remember a young boy I never knew, but who was and still is clearly such an inspiration to so many. Finlay Church, who attended Alvechurch Middle School, died this time last year from a brain tumour; he was only 11 years old. Many of you will know of him from his amazing teddy bear and hat chains in the park, which broke two world records and raised a staggering £100,000. I was in tears as I researched what an amazing person he was, and reading the letter he wrote to his family and friends just a few days before he died. No wonder the people who knew him wanted to create a special place to remember him. The garden for Finlay in the grounds of Alvechurch Middle School has been designed and built by the children, along with ceramic artist Jackie Nash, who has worked tirelessly with them – she was another person inspired by Finlay’s story. It’s a wonderful space and when Jackie showed me the designs the children had come up with earlier in the year, I was blown away. It’s nothing like an adult would design, and I mean this as a compliment! It’s not sensible; it is a colourful, bold celebration of Finlay’s life and how they saw his friendship. The garden is accessed off the main playground and is located in a little area of its own, which when it is completely finished will be a lovely place to sit and contemplate. 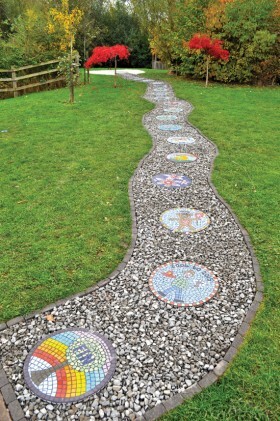 The path which leads up to the main part of the garden is gravel inset with stepping stone circles. All the stepping stones are mosaics, and each one tells a part of Finlay’s story. The first one is a simple tree with a rainbow behind that just reads “Fin” and then they carry on with different aspects of his life and how his friends saw him. There are a lot to do with him being very happy, his aspirations to become a policeman, some with teddy bears and hats – and a final one at the top of the path is his image from behind, holding a teddy bear and a balloon. The top of the path then leads into a white gravel area in the shape of two angel’s wings, and in the centre of this area is the main mosaic circle. Each segment of this circle was designed by Finlay’s close family members and it is stunning. The centre has orange tiles (his favourite colour) and has a simple “FJ” for Finlay’s Journey in the middle. Then each segment around the orange centre (and they are beautifully made by Jackie and the school children) has a moving tribute to him. His brother designed a sports segment, as Finlay loved sport; it shows the two of them and reads “Always with me”. His grandparents had drawn a beautiful image of a child being held in a hug. There are some heart shapes, and I’m sure this brave family must feel that theirs have been broken by the loss of this wonderful person. So my small part in this story was to help the children plant up the area under the trees with some bulbs which will naturalise. We used a daffodil called ‘Lemon Beauty’ and a single tulip called ‘Kings Red’, both of which are brightly coloured and joyful to echo the theme of the garden. We also planted some Alpines in the gravel to add some flower colour in the main part of the garden. This special garden is almost finished, but there is a bit missing. Jackie has sourced two curved stone benches for the top area which will overlook the main mosaic circle and allow the children to use this space, and so I’m putting out a plea to anyone reading The Village – if you would like to help with funding the benches, please get in touch with me and we can finish the garden to remember this very special person.